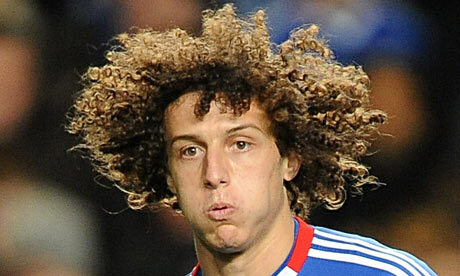 LUIZ "I could have joined other clubs but Chelsea were my first choice!" Our new hero David Luiz has spoken to the media over the course of the weekend and has revealed just how he has settled in at the club, the reason why he decided to join Chelsea and how he has taken to a liking to Steak and Kidney pies! "Everything has been very positive since I signed and I am very happy for this opportunity that God gave me to play at Chelsea, I have to keep my concentration and focus to become a better player in the future. As for Chelsea, we are still fighting for the title and the Champions League. I’ve joined a big club like Chelsea to win trophies and to ­continue improving as a player. The Premier League is the best league in the world, so I feel lucky that I have been given the ­opportunity to come and play here. I could have joined other clubs, but Chelsea match my own ambitions, They were always my first choice once I knew of their interest. From that moment I wanted to come here. They want success as much as I do, and they have some great players here. Great players make you a better player, and there was also the attraction of playing against some of the best ­players in football. I am at my most comfortable when I’m ­playing in the centre of ­defence. But I can also adapt to a number of positions ­including midfield. My only aim is to help the team, so I am happy to play where I’m asked. As long as I’m playing, I will always play with a smile on my face. When I pull on the shirt and play my personality completely changes. I am very competitive and very tough. I will fight for the cause and give everything I have. And sometimes I realise that I have to calm down for my own good. I am not a hard footballer. I don’t kick people. I just think football is a sport for men and we need to overcome our rivals as long as we keep it within the rules. But away from football I couldn’t be more different. I’m a very quiet guy and the simple things in life please me. I like to stay at home, talk to my family back home and generally take it easy. It is a surprise to me that fans of other clubs have praised my game and goals. That signifies I am having success with Chelsea. But I will say again, I am here to improve and to work with my new club, and not for individual success. Honestly, I don’t mind not scoring as long as we are winning. Although there are a few members of the Chelsea squad that can speak Spanish, it’s ­important that I learn ­English quickly. I’m not sure how fast that will be, but it will ­certainly help me settle in more quickly. My first goal for Chelsea will always be a ­special ­memory. I have a photo of it on my wall. It is one of the most ­important things in my house. It’s true I have scored two goals, with my right foot and my head, and it will be beautiful if I can get one with my left foot to complete the collection. Now my team-mates have demanded the Brazilian and Portuguese players at the club cook a meal for everyone full of typical Brazilian meats. We made a habit of doing things like that at Benfica because meetings like those are perfect for creating unity in the squad. In Brazil we have excellent meat for barbecues but the roast beef here is very good and the steak and kidney pies aren’t bad either. In Brazil the sun is always shining. In England they enjoy colder weather and plenty of rain. My family think I’m mad. They would never ­consider coming here because of the climate. I am a bad singer but I’m a good dancer. Brazilians have rhythm in their blood. Our carnivals are popular all over the world and I have seen how much the English like them. Sometimes I pick up a guitar and the bongos as well, like a lot of Brazilians. And I enjoy going to the cinema to watch action films – doing that and reading is ­helping me to learn English. My favourite words in English so far are ‘blue’ and ‘goal’. In the dressing room, I am always ­learning the worst words but I prefer not to reveal the names of those who are teaching me. I am used to Brazil and Lisbon, and they are very different from England, but I am ­settling in well, And I think the atmosphere in British stadiums is magic: songs, songs all the time during matches. It’s a wonderful spectacle. I already know what is typical in England, although the thing that does surprise me is the cars driving on the left – it is not easy for foreigners. For any Brazilian, football is not just a sport and to be on the list of those who have played for Brazil is something I’ll always be proud of, Now I am at Chelsea I want to make sure Brazilian fans are 100 per cent Blues fans. Liverpool and Manchester United are very much loved in my country, but now I want to change the landscape.